Follow the 15:00 GMT Premier League games here - the last set of Saturday 15:00 GMT games for a few months. "You are where you are in the division. During games there have been moments that have been pleasing. We know the predicament we are in but we need to finish the season strong. "I'm enjoying [managing] it immensely. The position I have is tough but I want to give the team an identity again." Fulham manager Scott Parker speaking to Sky Sports: "It was a tough day. From the outset we knew the challenge ahead. "In the first half it was a nervous start. We were 1-0 after five minutes and it would be uphill from there. "Them mistakes what we made came from pressure - they are an organised team, a well-coached team. "In the week we talked about trying to play, but them mistakes happen when you take risks. "We didn't get the result today, but the way we set up was not going to change. At 1-0 we had some good spells. "We have some good fixtures coming up - it's a very tough run of games. But there have been some massive positives along the way." "After the international break, you usually miss a bit with your rhythm, but the effort was there. This game was tricky - 12:30 on Saturday, a sunny day. That is unusual and that is why I am so satisfied. "We are going to do everything to win. No matter the next competition, we will win the game. "We don't think too much about what people say about the quadruple. "What Liverpool and Man City have done in the Premier League, both deserve the credit. That's why we are here." Manchester City boss Pep Guardiola on Sky Sports: Our first 15-20 minutres was one of the best of the season. We played with incredible spirit, we could have scored more. After the goals we controlled it. "At the end of the match, maybe the players were tired. We will be back in our rhythm. "It's important to have the rhythm. Kevin [De Bruyne] we wanted to give 90 minutes but maybe there was tiredness in his legs. We will not win the Premier League with 11 players. "Liverpool and Man City have done incredible so far so deserve the credit. We will have 80 points with six games to play if we win next week. Bernardo Silva, speaking to BBC Match of the Day: "Everyone was sad by the news [of Bernard Halford's passing], he was a very important person for the club. This win was for him. "We were very motivated knowing that Liverpool have one more game than us. We had to start the game with high intensity and that is what we did. "Three more points, knowing that we have a very busy schedule. We have the squad to do it. "This season, the team has been very focused after international breaks, we're very happy to come back fit, almost the entire squad is available and we are ready for hopefully the next two months to try and win some titles. "The team is very excited. This is the moment all players want to live. We can win them all, or lose them all. Everything is on the table." Fulham's Cyrus Christie speaking to Sky Sports: "It's always tough when you play a team of that calibre. You can't give them a sniff. They were clinical. We made it too easy for them. "We made it hard for ourselves. "We didn't test their keeper. We have another game on Tuesday and we have to do better. "We have six games left and mathematically we're still in it." Midfielder Bernardo Silva, speaking to Sky Sports: "We started the game very well, pressing high, creating chances. "The second half we tried to control the ball. We're very happy with three points and it's on to next one. "We press high, we try to make them make as many mistakes as possible. It's important for us to create so many chances from mistakes for our openers. "When you're top of the league, it's in your hands. If we win the seven games left, we will be champions." Defender Kyle Walker, speaking to Sky Sports: "We want to score more goals, but the most important thing is three points. I'm more than happy. "It's a pleasure to play with these players, it's a joy to go to training each and every day. We've got a busy month and a very important one. "I think we've done well all season, we had a little blip but apart from that we've done remarkably well in all competitions. "We need to take each game as it comes and pick up victories in all of them hopefully." Fulham failed to direct a single shot on target for the first time in their last 188 home league games, since April 2010 against Wolves in the Premier League. Plenty of team news flooding in for the 15:00 GMT games. Follow those by clicking here. Man City were the Man City we know here. They outnumbered Fulham, they got the goal early which settled them, and they were more comfortable than you would imagine. Fulham have come away with some credibility though. Andre Schurrle came on and made the difference. Scott Parker can come out of this unscathed. The team had a go and sometimes you have to accept that as a manager. The quality they faced today was beyond them. A couple of blue flares, the smoky kind, land on the Craven Cottage pitch. 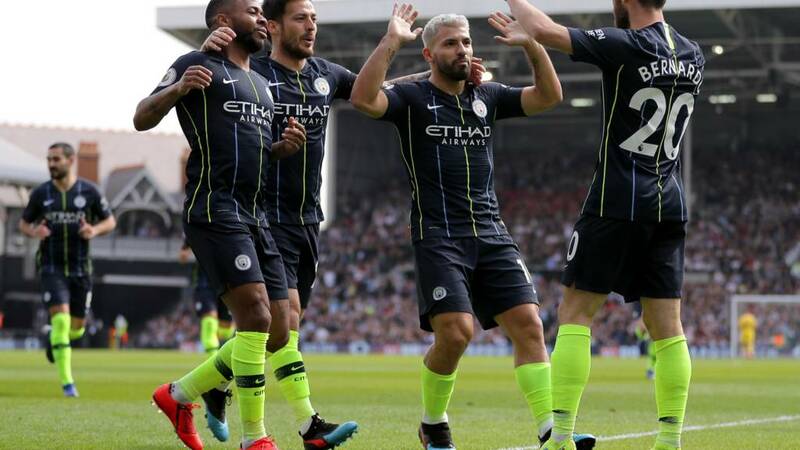 Pep Guardiola's men are back at the top of the Premier League. That was not a test. I repeat, that was not a test. This has been a comfortable game for Man City. They have gone through this unscathed, they've played well, they look on it, and they've come back from the international break with no injuries. Fulham have had plenty of possession on both wings today, but their delivery has been woeful. Once again there is too much weight on another ball flung in. Scott Parker has a look at his watch. We have four more minutes (minimum) to endu... until the end of the match. Pep Guardiola's only frustration must be missed chances. Man City have had so many chances and their finishing has been lacking. That was a great hit from Andre Schurrle, he struck it as though he was shooting. Unfortunately for Fulham, it ended right in the keeper's hands. Andre Schurrle's delivery hits a couple of players before falling into the grateful hands of Ederson. At the other end Raheem Sterling curls a shot wide of the target. That's the England man's last kick of the game - he is replaced by Riyad Mahrez. Ryan Babel comes off for Kevin McDonald - I didn't see who he handed the armband to.